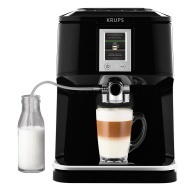 alaTest has collected and analyzed 63 reviews of Krups EA850B. The average rating for this product is 4.1/5, compared to an average rating of 4.4/5 for other products in the same category for all reviews. Opinions about the performance and maintenance are overall positive, whereas many are less positive about the price. We analyzed user and expert ratings, product age and more factors. Compared to other products in the same category the Krups EA850B is awarded an overall alaScore™ of 87/100 = Very good quality. Here it is the long awaited coffee machine and what a machine it is. While I have reviewed numerous machines before this is the first that uses fresh roasted beans, not ground coffee, unground beans freshly ground in the machine for each cup.